You can use some video stabilizer equipment to stabilize your phone or camera when shooting videos around. Or, you can fix the shaky videos in post-production with some vides stabilization software. There are many of such kind of video stabilizer software today. Some are paid and some are free, some can be used online, while others need to be downloaded to your Windows or Mac computer. The good thing about the paid ones is that they are giving a free trial so that you can try and check how the software runs and how efficient it can be. This ultimately helps them decide whether to get the premium version of the software or not. In this article, we will share with you some video stabilization solutions with most popular video stabilization software today [both Free and Paid on Windows and Mac] that are widely used by videographers, irrespective if their amateur or pro, read the following below. Need to stabilize your video on iPhone, check these best video stabilizers for iPhone in 2018. Wondershare Filmora9 is a very easy-to-use video editing software while allows you to create professional videos in Mac and Windows platforms. With Wondershare Filmora9, you can not only stabilize the shaky video footage, but also offer you multiple editing solutions for creating beautiful videos with ease. What's more, it allows you to export the videos into any format you like, such as MKV, WMV, MP4 etc, you can even burn the video into DVD with Filmora, or upload to social media platform directly. Let me show you the detailed information of stabilizing shaky videos in Filmora. After open Filmora, click the Full Feature mode to enter the video editing tools. Now, it is time to import your shaky video footage to Filmora Media Library by clicking the Import button to select files or just dragging and dropping your video clips to the media library. Drag the target shaky video into the timeline, and double click on it (or click the "Edit" icon on the tool bar) to open the editing panel. Select the Stabilization option from the menu. Then Filmora will analyze and stabilize the targeted video automatically. Click the Play button in the preview window to preview the shaky video. When previewing, you can adjust the stabilization smooth level to get a better result. You can save the stabilized video to the default location or change the saving path based on your needs. 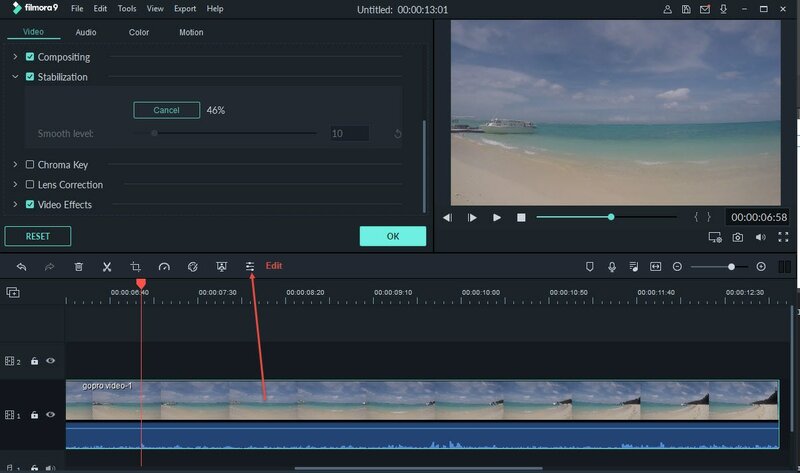 Click OK and the video clip in the timeline is stabilized by Filmora and you can apply other editing options like adding filters, transitions, effects, titles, etc. 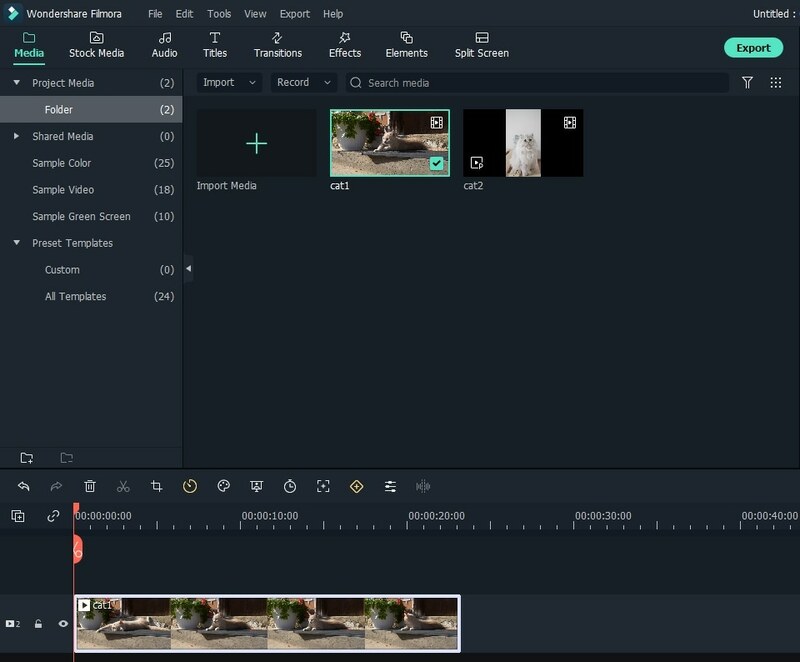 For the further editing tools that you can use in Filmora, you can check this introduction video below to find out how to edit video with Filmora. Note: If your video footage is shot with action camera, like GoPro action camera, then you can fix the shaky GoPro videos with the Lens Correction Tool in Filmora easily . This is a multifaceted video editing program which has a built-in stabilizing function. If you like to fix your shaky or jittery video, all you have to do is to download this program and follow the simple steps to using it and to finally stabilize your video. Open the software and then click the Add Media Files button in the software's import tab in order to upload your video. You will then see it at the Media tab. Stabilize your video. You can start with through dragging the video to the timeline on the program's lower part. Tap the little shaky camera icon over the timeline. Or, you can also do a right-click on the video and choose Stabilize Video. The video player located on the stabilization window's left side allows you to compare the edited and original video through clicking the Preview and Original buttons. Finally, tap the folder icon located close to the Save stabilized copy in order to select the destination where you like to save the video output. Step 3. Edit and save the video. Edit and save the video. Once the stabilizing process is done, the video output will then be added to the Media tab and so you can pursue working on it. To further edit your video, you can drag it to the timeline to add artistic music, titles, effects and others. Once you are done, click the button that states Save Movie and pick the right format. iMovie is the free video editing software compatible with Mac OS. If you have an iPhone or iPad, this software lets you enjoy your videos and stabilize videos on iPhone too. Its updated version is also compatible with the Apple Yosemite. It allows you to make gorgeous Hollywood and HD-styled footages. If once you are ready to show your masterpiece to the world, you can use its built-in iMovie Theater. You can get more information about how to edit videos in iMovie here . This software is only available in the latest version of Windows Essentials 2012. You should also have a Windows 8 OS to be able to use and take advantage of this feature. Before using this software, make sure you are not doing any other heavy tasks. This is to prevent hangs and other unpleasing behavior. Launch Windows Movie Maker and upload the project which has the video that you like to stabilize. Select the shaky video selection on the program's left-side section. Once the video to the stabilized is selected, the Video Tools will emerge on the ribbon. Click Edit and then click the Video stabilization option. Pick one from the following options: Anti-shake and wobble correction-low, Anti-shake and wobble correction-high and anti-shake. The program will process your jittery video. Once the process is finished, you can now play the video. This video stabilization software is compatible to both Mac and Windows OS. To use this, follow the steps below. Step1: Start a new project through clicking the file button above the screen, ensued by new and then new project. Step2: Upload the shaky video you want to stabilize through clicking the File-Import-File. Step3: After seeing your video upfront, you need to create a new composition to be able to work on it. This is done through clicking your file and dragging it toward the new composition button located at the window's bottom. Step4: To stabilize the video, find the animation button and under it, click the stabilize motion button. This will direct you to another subheading, the Warp Stabilizer where you can adjust effects and motions. A blue ribbon will appear across your video. Let this be until it finishes and change into color orange. When it's done, the orange ribbon will disappear. Step5: Convert the format into a movie. To do this, do not export the file. Find the Make Movie button that is under the Composition tab. This makes you save your video into a movie and on your desired destination. Above are some of the best video stabilizer software that you can use to remove the shake from video and the steps of how to stabilize. I hope it is useful for you when polishing your video footage. If you want to stabilize videos on your Windows and Mac for free without downloading any 3rd party video stabilization software, you can try Windows Movie Maker [for Windows 7 users] and iMovie [for newly mac computer with it built in]. For experienced professionals who also has a high budget, you can try Adobe After Effects. While for beginners and semi-pros who want to stabilize shaky videos without any efforts, we recommend you to try Wondershare Filmora. Besides the video stabilizer tools, Filmora provides almost all editing tools that you may need in video editing.